If you were to pick out one industry where the need for diversity and inclusiveness is most prevalent, most of you would say the tech industry. That’s because over the past few years, we have seen plenty of diversity issues arising in some of the biggest tech brands in the world. We won’t name anyone, don’t worry. But now more than ever, many would say the tech industry is pioneering the push for cultural inclusion and gender equality in the workforce. So we wanted to generate our own understanding of the state of diversity in tech, using our own proprietary methodology, the Employer Brand Index. We scoured through thousands of publicly obtainable comments, updates and reviews on user-generated platforms like Reddit, Glassdoor, Twitter and many more to dissect only data points within diversity, inclusion, and equality. We looked at all English language-based comments in Q1 of 2018 (January, February, and March) to ensure that these findings are as current as possible. But it’s important to note that while these findings might be current, they may not be entirely representative. We then measured these findings using our Employer Brand Index methodology, scoring each company on our 1 to 10 scale, 1 being the best score you can get and 10 being worst. Everyone is aiming for position 1! Analyzing these 10 tech giants, we found some common themes come up that showed the direction many of these companies are undertaking is strikingly similar. What is clearly evident is that there is a real commitment to empowering women in tech, with all 10 tech giants showing positive commentary, some more than others, towards this topic. We found a plethora of women celebrating each other and their achievements at these companies, as well as many mentions of the women-friendly environments being cultivated in their workplace. Yet all is not perfect for women, with what still seems to be a lack of women in leadership positions and a disparity in pay between men and women. But based on the overall outlook of this research, we are confident that things are on the up for women in the tech industry! The narrative for a long time is that the tech industry, especially topics such as computing and coding, are interests reserved for boys only. And yes, at times, this theory was backed up in our research, with the referencing of a “Boy’s club” environment at companies such as IBM and Oracle. 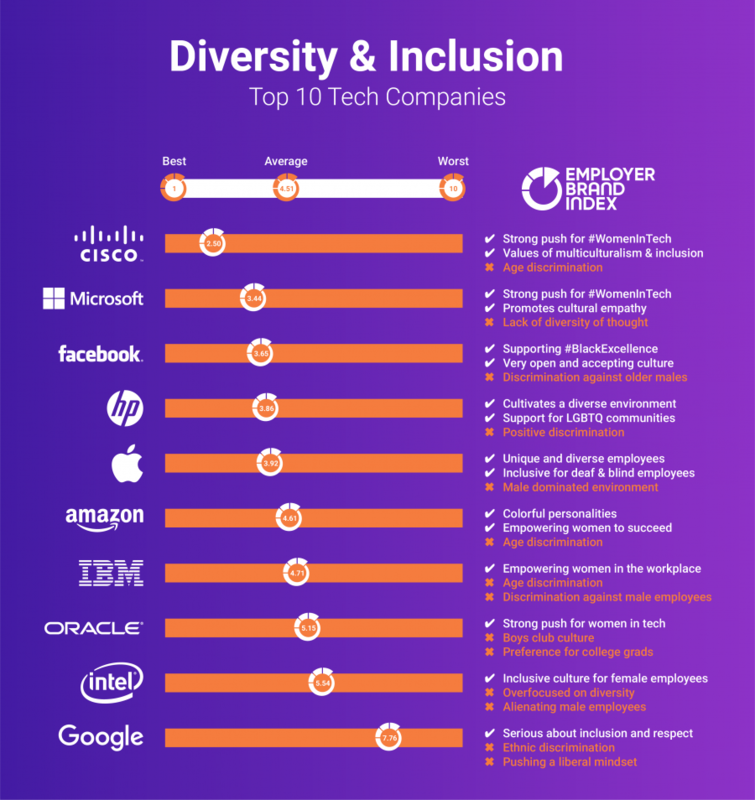 All of these aspects represented a positive step in the direction that the tech industry is taking and the various strategies these companies are taking to improve their diversity and inclusion. Yet within this process of diversity and inclusion, some believe there might be the existence of positive discrimination towards one specific demographic: white males. This was backed up by Google’s low scoring (7.76) on the Employer Brand Index due to the belief that some employees are discriminated against because they are white and of the male gender. As well as the alienation of males in general throughout this research in places such as Microsoft and Intel. So while it is evident that the tech industry is doing their all to balance out racial and gender disparities at their businesses, are they doing this at the expense of white males? One of the more prevalent topics in this research was the idea that the tech industry was a young or millennial industry. This was backed up by the negative commentary found at companies like Facebook and Amazon where people felt like they were slowly being replaced by grad students, or that the working environment itself is no place for someone above the age of 30. So while there is much focus in the tech industry on racial, cultural and gender-focused diversity initiatives, there seems to be less focus on reducing the culture of ageism being cultivated. With Generation Z entering the workforce, and what will evidently be four different generations working and looking for work, this diversity in age and experience can be extremely valuable to the tech industry. Focus on diversity of thought instead! This is not to say that aspects like culture, background, and gender don’t encompass diversity of thought. They do, having a workforce with people coming from all backgrounds can be very beneficial to business in many ways. Yet what is evident is that there is lack of focus on the concept of diversity of thought. Rather than solely focusing on recruiting and hiring employees from a specific race, maybe focus on recruiting an analytical person or a creative person. Because if you have an extremely multicultural and multiracial workforce, but everyone thinks the same way, then are you truly creating a diverse environment? To truly be inclusive and diverse, companies should be focusing on creating an environment full of different viewpoints, opinions and thinking styles. Within this process, you will naturally be creating a diverse working environment full of different genres, sexual preference, cultures, and eliminate many forms of bias. Below is the graphic we have to put together to illustrate and summarize what we found. 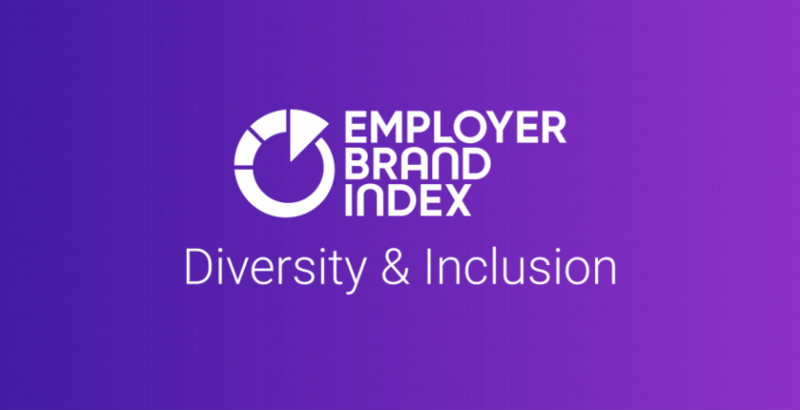 If you’re interested in how your company measures up for D&I and other attributes, check out the Employer Brand Index today. For a more extensive report of these findings, head to Diversity & Inclusion at 10 Top Tech Companies.